Are you looking for an affordable (one of the most expensive ones being Lemur) app that supports connecting your iPad directly into your DAW via midi (not JUST over wifi) and send midi messages? “Musicians, now you can turn your iPad into a clean, small, sophisticated midi controller that remotely manipulates your DAW, your plug-ins, any sounds or effects on your computer while you play, without having your computer in front of you, AND without the pesky and troublesome wires. It is quickly customizable, so you can change your controller’s functions to meet the needs of the moment, and to adapt to whatever hardware rig you’re using. Plus, it’s able to be used wirelessly, or wired, or both, depending on what you need — live performance, studio recording, audio engineering, composing — the list goes on. • A way to control the sounds in your computer, as you play, without having your computer in front of you, without wires, without a router, and without having to purchase a hardware module. • A cleaner live performance setup without a computer in front of you taking center stage. • Ability to command computer sounds, effects, and parameters from afar, without the cables. • No more struggling with a laptop trying to press a key or work the trackpad while you play. • Switch sounds while playing live, add reverb, do a quick EQ, start a backing track playing from the front of the stage, with your big clunky laptop tucked away back stage. • Start and stop the DAW from wherever you’re recording, switch recording tracks, solo/mute tracks, etc., without running back to the board. Now the iPad can function the same way a hardware controller would, except it IS the hardware controller, and it IS wireless, so you can “cut the cord” from using ordinary controllers that require cables to connect to your computer, AND you can completely customize your controller’s function for the needs of the moment. Observes the MIDI Specification using conventional messages. • Built for Core MIDI and Multi-Core devices. 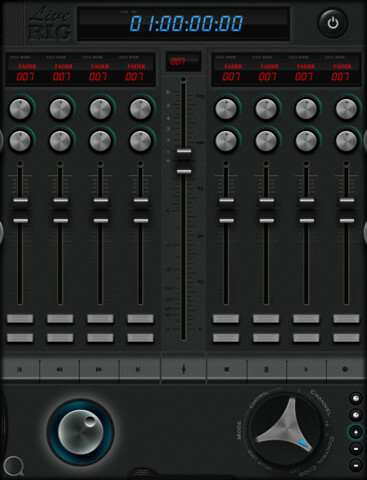 • Knobs, Encoders, Faders & Buttons send and receive MIDI Control Change messages. • MIDI Machine Code and Control Change messages can be configured for transport controls. • Incoming MIDI Time Code is displayed on the main LCD in realtime. • Send Track Record Enable messages for managing up to 24 tracks. Transform that USB MIDI Device into a Wireless MIDI Device. • Works perfect with the Camera Connection Kit. • With iRig MIDI, control any MIDI Device while making it wireless enabled. • Connect your MIDI device and send MIDI to any device that supports Core MIDI. • Using the Camera Connection Kit, send your MIDI Keyboard to your iPhone! LiveRig gives you the power to configure Core MIDI the way you need it. • Use the built in controls to send messages to other devices on the wireless network. • Send messages to a wired MIDI device using the Camera Connection Kit, iRig MIDI from IK Multimedia, or other Core MIDI capable interface. 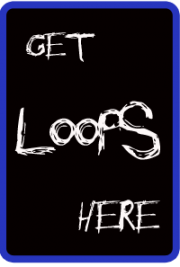 • Manipulate the cables within LiveRig to route messages to other Core MIDI enabled apps. • Control Mac apps like Logic, MainStage, and even GarageBand by installing MainStage GarageBand Controller that utilizes AppleScript.